So if you’ve been reading my blog for a while, you know I started using eMeals and Safeway Grocery Delivery sometime last year. I’ve been pretty happy with it, for the most part. Usually I pick out about 4 meals (out of the 7 recipes sent) each week and order the groceries for them. I pay a bit for the groceries to be delivered, and I often end up with a lot of extra food. Also, I’ve gotten kind of bored with the recipes from eMeals lately. They’ve used some repeat things some weeks, like for example, the side for 3 meals one week was sweet potato tater tots. Not that I don’t like sweet potato tots, but who wants the same thing 3 times in one week? So I decided to look around and see what other options were out there. Enter Blue Apron. Blue Apron covers both the recipes and the grocery delivery all in one. You sign up for their service, which is $59.94 each week and includes 3 meals, each including 2 servings. That might sound expensive, but honestly after including the cost of eMeals for a year, plus the cost of grocery delivery, it’s really not that much more than I’ve been paying. And $9.99 a meal is still quite a bit cheaper than eating out at most restaurants, especially those that would serve the kind of meals that Blue Apron provides. Also the serving sizes for the Blue Apron meals are actually a bit bigger than what I was getting with the eMeals recipes. One of the reasons we started with eMeals was to eat low-calorie meals at home, which means we chose the 500-calorie eMeals plan and all our recipes are just 500 calories or less per serving. The Blue Apron servings seem pretty healthy too, but (probably because the serving sizes are a bit larger) they tend to be between 500-700 calories per serving so far. 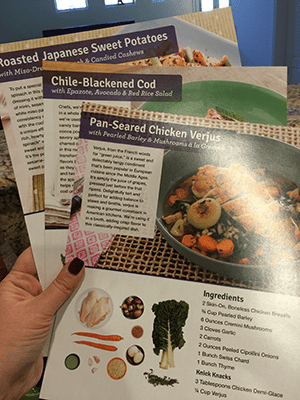 The cool thing about this is that I’ve actually been able to get 3 servings out of each recipe and it’s about the same amount of food we were getting from each eMeals meal. It also means we can get 8 or 9 meals out of the Blue Apron delivery each week instead of the 6 meals that it’s supposed to be. Check out RTGPKG.com to see the options of storing your food by using appropriate packaging. So far, I’m actually pretty impressed with Blue Apron. Ricky’s comment about it was that the meals seemed like they were a bit of a higher quality. The recipes certainly seem fancier to me, using some ingredients that you wouldn’t normally use when cooking at home too often, and some that I’ve never even heard of. The Blue Apron meals also seem to have a lot of flavor so far, which is something that was sometimes lacking in some of the eMeals recipes. Some of them just didn’t have much of a taste to them, really. Ricky especially complained of this a lot. He basically puts Sriracha on everything, and he did that with pretty much everything I made from eMeals. With Blue Apron, I’ve at least gotten him to try a few bites of the meals before adding Sriracha, and he even seems pleased with the flavors. I really love Blue Apron’s branding and the ease of use of their website and recipes. The website looks very clean and is easy to navigate. Signing up is an easy process, and once you do, you can easily find what your next meal delivery will be. You get the option to select what kinds of meat you don’t want in your recipes (I opted to not get any with lamb) and then Blue Apron picks 3 recipes for you to get that week. Once the recipes show up on the website for a week, you can choose to pick from certain combinations of 6 different ones, so you do get some options each week. You can also choose to skip weeks, which I did for next week, since I will be gone and I don’t see Ricky cooking the meals on his own. You choose the day that you get your Blue Apron ingredients and recipes, and I chose Friday, because I work from home that day and it’s the day I was used to getting groceries delivered anyway. Blue Apron also sends you everything in a cardboard box that’s packed really well with ice packs in a refrigeration pack, so even if you’re not home when the delivery is made, the food will stay good. The featured image on this post is all of the ingredients laid out for all 3 of our meals from Blue Apron for this week. 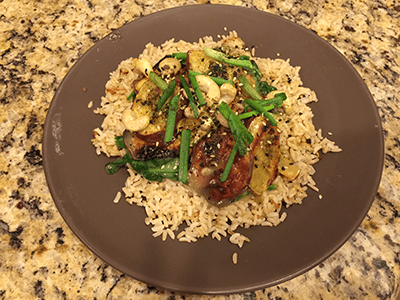 Tonight I made our third and final meal for this week from Blue Apron. So far they have all turned out pretty well, honestly. Despite Ricky complaining how there’s not enough food (because I split them into 3 servings instead of 2), it’s actually about the same amount we were each getting with a serving of an eMeals recipes. (He always complained there wasn’t enough food with those too.) Tonight we were both pretty hungry, so I actually just did 2 servings of tonight’s recipe, and it seemed like a lot to me. Overall, if you want to cook healthy meals at home, and you are not big on all the time it takes to plan meals and shop for groceries, I’d definitely recommend checking out Blue Apron. As an introvert (that lives with a very social extrovert!) who needs her free/down time pretty often, I’m always looking for ways to save time, and I know that can’t be fast food or eating out all the time. Blue Apron seems like a good fit for us so far. I look forward to seeing what’s on the menu next week!